The school has dramatically downsized its campus and taken on far smaller incoming classes as part of its effort to prevent the loss of its national accreditation. 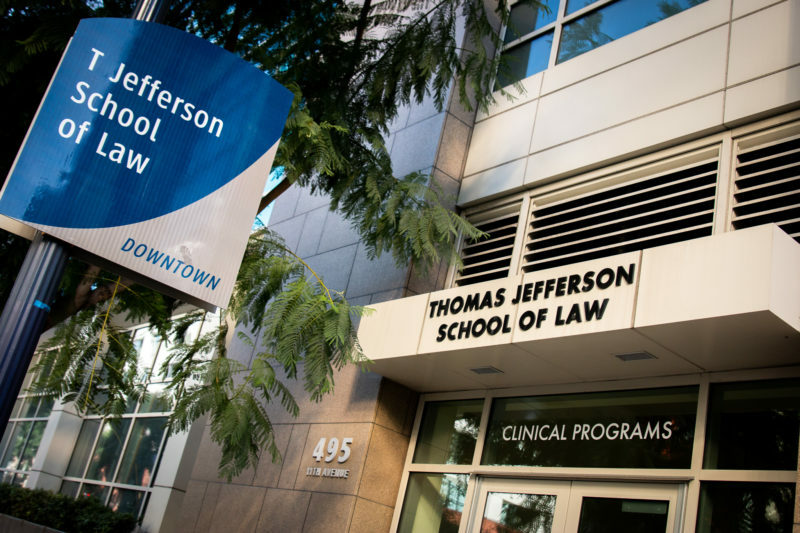 Thomas Jefferson School of Law has been in near-constant turmoil since taking on significant debt to build a new $90 million facility in the East Village amid the financial recession last decade. Paying off the bonds for the upscale building during a period when consumer interest in law school precipitously dropped proved difficult, resulting in persistent financial woes. The San Diego institution’s graduates have also struggled to pass the bar exam and secure legal jobs, generating unflattering headlines that have made it challenging to attract new students who could reverse those trends. Last year, the bad news got worse: The American Bar Association placed Thomas Jefferson on probation and warned that a rapid overhaul was needed for the school to maintain its national accreditation. In hopes of forestalling the loss of the ABA’s blessing, the school has in recent months drastically reduced the size of its student body and physical footprint. Its efforts to right the ship are continuing amid a change in leadership prompted by its dean departing abruptly last month after slightly more than a year at the helm. While the school has made some apparent progress on the financial front, its graduates’ recent bar exam results have been dismal. Just 30 percent of the school’s first-time takers passed the July 2017 California exam, by far the lowest percentage among the state’s 21 ABA-accredited schools. The average success rate on that test for those schools’ first-timers, even when factoring in Thomas Jefferson, was 70 percent. On the state’s July 2016 test, only 31 percent of Thomas Jefferson’s graduates passed, which was tied for the second-worst performance among its peer schools. Its graduates have also fared poorly on California’s February exam, which typically draws far fewer test-takers. “It has been of concern that the bar passage rate has not been where we want it to be,” said Randy Grossman, chairman of Thomas Jefferson’s Board of Trustees. The school-by-school statistics for the July 2018 California bar exam are expected to be released in the coming weeks, but the overall results do not bode well for Thomas Jefferson. Just 40.7 percent of test-takers passed, a 67-year low for the summer test, according to data the State Bar disclosed Nov. 16. Legal education experts have said Thomas Jefferson’s subpar bar exam results, which have come amid a steady decline in pass rates nationally, can be linked to the academic credentials of its incoming students. Law students’ scores on the Law School Admission Test, known as the LSAT, have been shown to be predictive of bar exam success. The LSAT is scored on a 120-180 range, with 180 being the highest score. In 2010, Thomas Jefferson’s incoming class had a median LSAT score of 151. By the 2016 entering class, that figure had fallen to 143, the lowest among the state’s ABA-accredited schools. The consumer group Law School Transparency has said law school applicants with LSAT scores of 144 or below are at an “extreme risk” of not passing the bar. Meanwhile, the ABA’s legal education council determined last year that Thomas Jefferson was out of compliance with the standard requiring it to only admit applicants who appear capable of completing law school and passing the bar. Thomas Jefferson officials said the primary way the school is working to combat the ABA’s bar exam and admissions concerns is by reducing the number of J.D. students it admits. Doing so, officials said, allows the school to be much more selective. As far back as 2011, the school admitted 440 first-year students. But as law school demand decreased, the school in recent years enrolled less than 250 first-year students, including 215 last year. This fall, Thomas Jefferson enrolled only 43 first-year students. The school also recently announced it won’t be enrolling new first-year students for the Spring 2019 semester. Admitting a smaller class has already produced a cohort of new students with improved academic credentials, said Interim Dean Linda Keller. The median LSAT score for this fall’s entering class rose from 144 to 147, she said. The school has also taken steps to help students perform better on the bar exam, the dean said. Those actions include additional workshops, one-on-one support and curriculum revisions. “The faculty decided to really increase some of the practice that we do in our classes so that students really see how all of this is integrated from day one, and it’s not something that you start after you graduate,” Keller said. As for Thomas Jefferson’s financial challenges, many date back to the school’s construction of an eight-floor, 177,000 square foot building on Island Avenue amid an economic downturn. The state-of-the-art facility that could hold upward of 1,000 students opened for classes in 2011, but the school struggled to repay the $130 million in associated debt as interest in law school declined. In 2014, the school reached a debt restructuring agreement in which it sold the building to its bondholders and had its outstanding debt reduced from $127 million to $40 million. Thomas Jefferson agreed to lease back the facility for $5 million a year while paying $1 million annually in interest of the outstanding debt, cutting in half its previous yearly payments. But the school’s financial difficulties continued and later drew criticism from the ABA and the U.S. Department of Education. The school was placed on the DOE’s “Heightened Cash Monitoring” list in December 2015 – it remains there today. In order to improve its financial picture, the school announced last spring it was moving out of its Island Avenue home. Thomas Jefferson worked out an agreement in which its outstanding debt to the bondholders was canceled. The bondholders in turn sold the property for $75 million to a real estate investing and operating company based in Colorado. Thomas Jefferson recently moved to several floors in an office building at 701 B St., where it leases roughly 56,000 square feet. Keller said the transition to a smaller space enabled the school to make a much larger cut in class size “rather than the incremental changes” undertaken in previous years. The school is also saving $4 million annually in rent alone due to the move. “It enables us to take the savings and re-invest in the school and the students to provide them an even better-quality education,” said Grossman, the board chair. In addition, the school plans to continue to cut its payroll in the coming years. A document Thomas Jefferson submitted to the State Bar of California this summer said the school projects its $7.8 million payroll budget in fiscal 2018 will be slashed to $4.2 million by fiscal 2021. Keller acknowledged the faculty has been trimmed previously and said further reductions are being evaluated. One way the school hopes to generate more revenue is by growing its non-J.D. programs. There are roughly 50 students in those programs, which include master of laws offerings. Keller said she expects the school to be removed from the Department of Education’s cash monitoring list in the spring. Law school experts said Thomas Jefferson faces an uphill climb to effectively address the multiple issues it is confronting. Tuition for its full-time J.D. students in the 2018-2019 academic year is $49,500. Meanwhile, Thomas Jefferson’s 2017 graduates performed the worst among those from the state’s ABA-accredited schools in securing long-term jobs mandating a law license, or providing an advantage to those with a law degree. Just 32 percent of the school’s graduates landed jobs in those two categories by the 10-month mark after graduation, according to ABA figures. At the end of that same time period, 51 of the school’s 174 graduates who sought jobs, or 29 percent, were unemployed. The average indebtedness of Thomas Jefferson’s graduates who take on debt is also the highest in the nation among law schools, according to U.S. News & World Report. The average indebtedness for the school’s 2016 graduates was $198,962, and 91 percent graduated with debt, the publication reported. McEntee said Thomas Jefferson’s high cost, combined with its poor post-graduate figures, makes recruitment of highly credentialed students difficult. Derek Muller, a professor at Pepperdine University School of Law, said the sharp drop in law school enrollment caused by the financial recession also has posed problems for schools like Thomas Jefferson. First-year law school enrollment in California declined 29 percent between 2010 and 2017, according to Law School Transparency. Muller highlighted that Thomas Jefferson’s struggles have come in a climate in which other ABA-accredited law schools have closed or disclosed plans to shutter. Whittier Law School in Orange County announced last year it would be closing amid poor bar exam performance by its graduates and financial issues. “Thomas Jefferson faces significant challenges other institutions have not been able to survive in recent years,” Muller said. Thomas Jefferson officials have not publicly expressed any fears of closing, but whether the school’s turnaround efforts will be enough to maintain the full ABA accreditation it has held since 2001 has yet to be determined. The ABA said last year that Thomas Jefferson was “in a position where only immediate and substantial action can bring about sufficient change to put the law school on a realistic path back to operating in full compliance” with its standards and rules. Earlier this year, the ABA sent a fact-finder to review the school’s operations. The school provided updated information in response and will do so again regarding recent changes, Keller said. Those ABA-related documents are confidential, according to the ABA and the school. Aaron Schwabach, Thomas Jefferson’s associate dean for strategic initiatives, told a State Bar committee recently he anticipates the ABA will provide an update on the school’s status early next year. The ABA declined to comment on a timeline. “I believe the school has done and continues to do everything that has been asked of it to meet and exceed the ABA standards for accreditation,” Grossman said. But the school also took the precautionary step of asking the State Bar of California to step in to provide state accreditation if it were to lose its ABA stamp of approval. The California bar’s Committee of Bar Examiners voted 8-7 in October to approve Thomas Jefferson’s application at the recommendation of staff, though some committee members in opposition expressed concerns about the school’s high cost and its graduates’ debt load. The state accreditation kicking in would ensure Thomas Jefferson’s graduates could still take the California bar exam, and Keller said the school sought the security net at the urging of concerned students. Under solely state accreditation, however, graduates would no longer be automatically eligible to take the bar exam in other states. The loss of ABA accreditation can also prevent a school’s students from obtaining federal loans, but that would not yet be an issue for Thomas Jefferson. The school is in the midst of seeking regional accreditation from the WASC Senior College and University Commission, and its candidacy status granted in 2016 permits its students to obtain federal loans. Thomas Jefferson, which previously held regional accreditation, has until June 24, 2021, to secure it again. Since July 2017, the law school had been confronting its various challenges under the direction of Dean Joan Bullock, who came to San Diego after having served as an associate dean at Florida A&M University College of Law. But last month, just a little over a year into the job, Bullock abruptly announced her resignation. “I am resigning from the post of president and dean because I firmly believe that Thomas Jefferson School of Law is on the right path to maintain full ABA accreditation status by continuing its conservative fiscal policy while ensuring the retention of sufficient resources and its excellent personnel,” she said in a statement at the time. Keller, a member of the faculty since 2003 and most recently a vice dean, was elevated to interim dean. Karin Sherr, the school’s general counsel since 2013 and vice president since 2015, was named interim president. Grossman said recently that the Thomas Jefferson board had not yet addressed the issue of whether it will launch a search for a permanent dean. He said the panel is satisfied with the “status quo” for now. Keller said she would be interested in serving in the dean role on a permanent basis. “I have been a part of this community for a very long time, and so whatever is helpful to continue the progress of the law school is definitely something I’m interested in,” she said. But for now, she has plenty of other matters that need addressing.